2017 MD Lighthouse Challenge – Chesapeake Chapter U.S.L.H.S. A HUGE THANK YOU TO OUR VOLUNTEERS AND SPONSORS! September 16 and 17, 2017, with an early bird date of Friday, September 15 on Maryland’s eastern shore..
Complimentary souvenirs will be given at each Challenge location. You are welcome to visit any number of lighthouses along the Challenge route, but you will have to visit all mandatory stops to be able to proclaim “I’ve seen the lights!” and collect a specially designed souvenir to mark your accomplishment. Visiting these lighthouses is not counted toward event completion, but will take Challengers to three more beautiful Bay locations, earning them extra event souvenirs! 1. Print out the Driving Instructions (COMING SOON!). After Challenge Survey – 2017 MD Lighthouse Challenge We would love to hear from you, whether or not you attended this year’s MD Lighthouse Challenge. If you only visited one or numerous lighthouses, attended previous years or other state challenges, we want your feedback to help us make the event a bigger success! Thank you! Collectible Pin – 2017 MD Lighthouse Challenge The 2017 Maryland Lighthouse Challenge Collectible Pin. Available at select stops along the Challenge route. At this time, it is anticipated that the stops will include Concord Point, Drum Point, Hooper Strait and Piney Point. Any change will be noted on the Challenge webpage as the event draws closer. 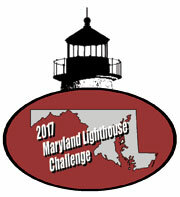 T-Shirt Design – 2017 MD Lighthouse Challenge Introducing the 2017 Maryland Lighthouse Challenge T-Shirt Design. Available at select stops along the Challenge route. At this time, it is anticipated that the stops will include Concord Point, Drum Point, Hooper Strait and Piney Point. Any change will be noted on the Challenge webpage as the event draws closer.